The Uilleann Pipes are the national bagpipe instrument of Ireland. It's unusual and complex one in its construction, requiring from a player quite a bit of mastership. With this library - a complicated instrument like the Uilleann Pipes - now becomes easy available to anybody! In our library we sampled two full octaves for the chanter - main instrument's reed, including fast and slow legato notes, as well as other articulation like vibrato, staccato and mordents. The legato speed can be control in three ways - through a keyswitch, midi-controller or velocity sensitivity. Another outstanding feature of the library - a special range on keyboard for playing regulators and regulators' chords like a real bagpiper usually does it with his wrist accompanying chanter's melody with simple harmonic backing. But for you it will be no intricacy - just use your left hand like on a piano. Usually the Uilleann Pipes' drones are tuned to D key and thus their regulators can produce only certain notes. We removed that limitation! You can choose any tonality to perform in. Also the regulators range was extended to a chromatic scale. Plus we designed the suitable ways to turn on/off drones, bellows noise and other bagpipe FXs, which help to provide the realistic sound of the library. 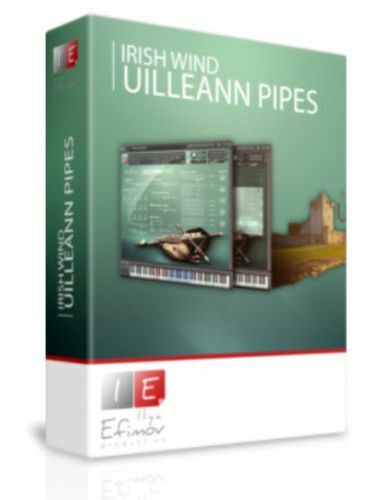 With this library you are given at your disposal the unique reeds' blend and harmonic structure of the complex Uilleann Pipes, which are famous of sounding sweeter and quieter than many other bagpipes.